If you’ve seen pictures of Turkey in a travel agent’s window there’s a good chance you were seeing Oludeniz. It’s often rated up there among the most beautiful in the world. The beach on the Blue Lagoon side is pebbled but with the ample shallow and calm waters this is a family favourite. Access to the beach and the ‘park’ is restricted and there is a minimal daily usage fee, but considering there are good facilities and the beach has an official Blue Flag rating this is a small price to pay. The other beach directly faces the Mediterranean Sea so there are waves to contend with if you want to go swimming. However, this vast beach always has plenty of room for everyone. Just 50 meters from the beach you find a very popular hotel, Jade Residence. 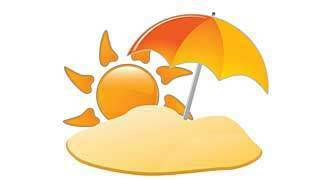 A good 5 star hotel is Belcekiz Beach Hotel. 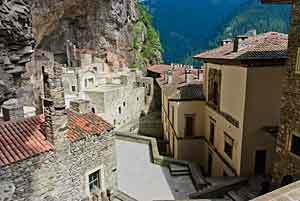 There are several 4 star hotels to choose from too, that are just great. 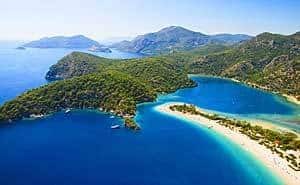 When looking for a hotel in Oludeniz be aware that there are two main areas where hotels are situated – on the coast, by the beach, and centered around the actual town of Oludeniz, to the north up the mountain. 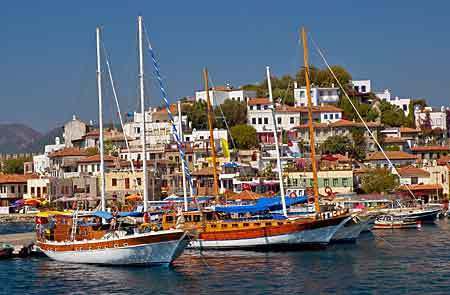 Oludeniz is located just a short distance south from Fethiye. 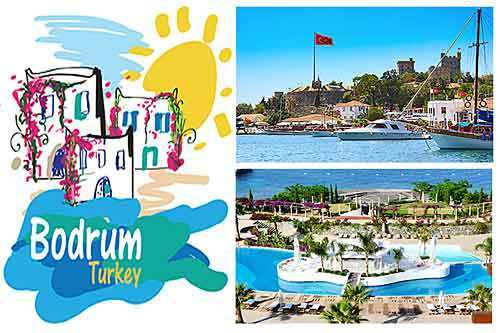 If you arrive by boat or yacht, you’ll see the vast sweeping sandy beach that fronts the sea, while the famous Blue Lagoon is accessed via a narrow opening between two peninsulas. 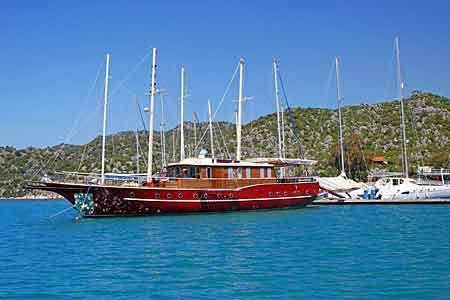 What makes Oludeniz so amazing? It’s the Blue Lagoon that many visitors remember. It is places like this that give turkey’s coastline one of its nicknames – the Turquoise Coast. Being such a beautiful place it is reassuring to know that this is a national nature reserve and construction is prohibited, so it will always be preserved for generations to come. surrounding this beautiful location is a popular activity too, and great if you want to spend a few hours away from your yacht hire. 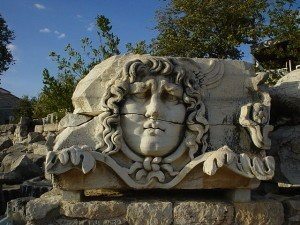 The scenery is stunning, and you can even link up with the ancient Lycian Way that starts just north of Oludeniz in Ovacik. This ancient trail traverses over 300 miles (500 km) in total. is a popular day trip. This impressive canyon is one of the deepest in the world, and from about April through the summer you are able to hike along a section of it. 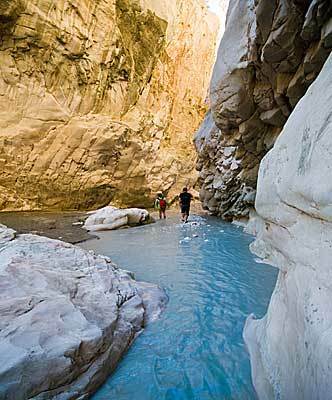 The cool shaded parts of the canyon are a welcome relief from the high temperatures of Turkey’s coastline. 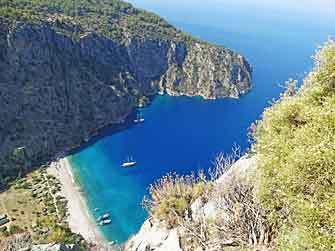 less than 10 miles from Oludeniz where there is also a canyon plus a beautiful bay and beach, and usually numerous butterflies to see. 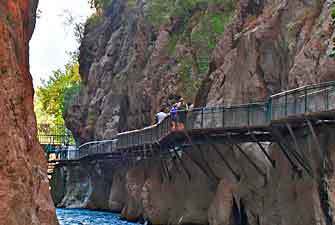 This can only be reached by boat, so either take a boat tour from Oludeniz, or make this one of your stops on a Blue Cruise. 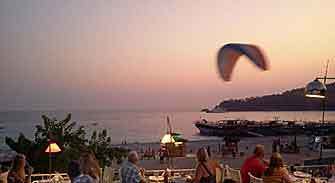 As well as the Blue Lagoon, Oludeniz is known as one of the best places in the world for paragliding. As you relax on the beach, or on the comfort of your luxury yacht, you can watch the many para-gliders making their way gracefully down from the mountains that surround the Blue Lagoon. 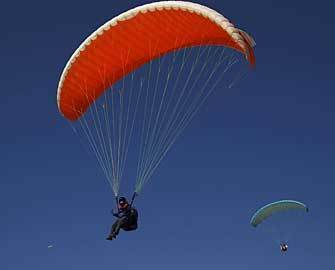 The wind currents, and of course the spectacular views, are among the reasons why this is such a good place to try this sport, and there are a number of companies who offer glides for both skilled and first-time gliders.